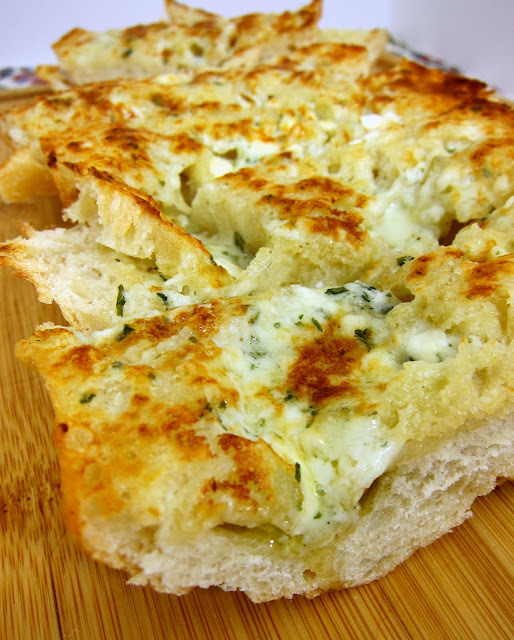 Gorgonzola Garlic Bread Recipe - french bread topped with butter, garlic, gorgonzola and parmesan - SOOO good! Great with pasta! We had this garlic bread with the Chicken Ragu with Linguine I posted yesterday. I found this recipe on Pinterest - my favorite place for inspiration! I've never had gorgonzola garlic bread before, but I thought it sounded like a great idea. I gave it a shot and WOW! This bread was so easy and dangerously delicious! The gorgonzola took the garlic bread to a whole new level. We both really enjoyed it. I've already made it several times. It is quickly becoming a household favorite! Cream the butter with the gorgonzola cheese. Mince garlic and add to cheese mixture. Add chopped parsley, and season with salt and pepper. Slice bread in half lengthwise. Spread cheese mixture on each half of bread. Sprinkle top with Parmesan cheese. Place bread under the broiler until cheese is melted and bubbly. Cut into slices and serve. Yea! So glad you tried this...I see it all the time on Pinterest. I'm not a huge fan of gorgonzola, but I may have to try it out! Oh,no, Stephanie - another recipe I can't resist. I'm still recovering from your 2 fantastic recipes for sour dough bread pulls. This would be wonderful with a big green salad. I am spending most of tomorrow, making YOUR breads for my fellowship group. And, Now, you add another...! One thing I love about your cooking is that you bring ingredients to the table that I've never heard of and, girl...*shhhhh..I am 73 yrs old. Never heard of gorgonzola cheese. Have to fix your bread recipe! It's got to be good! Hope everything is going well with your kitties! Best to you and your family! FYI Steph - If you allow the cheese mixture to cool in the fridge, a spoonful makes a great topping to a rare crusty steak!! Betsy - that is evil! I will be doing that next time we grill steaks! I think I could just eat the whole loaf and then tell the family, "Sorry, I burned the bread and had to toss it." I do enjoy gorganzola, this looks too good. I'm glad you tried my recipe and liked it. Great photo. I saw this on Pinterest too I've been too chicken to try it, especially with gorganzola cheese not exactly being cheap. Can you prepare this ahead of time and then just pop it under the broiler? Absolutely. Just keep it in the fridge until you are ready to bake it. This bread was very good!!! I definitely will make it again!....and again... and again.